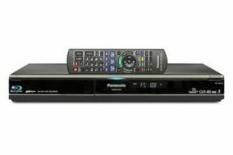 Panasonic DMR-BS850 review | What Hi-Fi? If Panasonic gets its way, this is the ‘one box to rule them all' in the front room of the future. The DMR-BS850 is the first product to hit the UK that combines a Freesat+ PVR with a Blu-ray player/recorder. That's right, not just a 500GB hard disk to fill with high-definition content, but also the chance to archive HD to Blu-ray disc. Standing a tad taller than Panasonic's BD player, it's an achievement in terms of design. It's a similar story with the familiar but beefed-up remote control, the few extra buttons not diminishing from a fairly clean and intuitive layout. Twin Freesat+ tuners give you plenty of flexibility. You can record two programmes at once, pause and rewind live TV and series record. Elsewhere, the eight-day EPG has a mind of its own – in a rather useful way. It prompts you when an SD programme is available to record in HD and auto-updates to incorporate changes to the schedule. High-definition Freesat content is recorded in direct bitstream, so there's no compression of picture quality or loss of any broadcast surround sound. Five recording modes allow you to squeeze even more room out of the already roomy 500GB hard disk; the lowest setting offers 240 hours, and you'll get 77 hours in the highest-quality mode. The Freesat performance is excellent, with sharply drawn images, natural colours and plenty of detail – qualities enhanced when watching HD. Largely free of noise, the picture benefits from authoritative sound, while both are complemented by an intuitive interface. Recording quality is nigh-on faultless in the top ‘DR' mode. With so much HDD space we see little reason to veer from this. Should you wish to, though, the compressed modes hold up well. This Profile 2.0, BD-Live-compatible player, is capable of outputting 1080p/ 24fps video content and decoding all HD audio formats. There's an Ethernet connection for upgrades, streaming media and accessing Viera Cast, and SD card and USB inputs for viewing, copying and editing content from camera or camcorder. There's even a built-in Gracenote music database should you wish to use the HDD as a jukebox. Picture performance is comparable with the best sub-£400 Blu-ray players; for playback this is essentially the Panasonic DMP-BD80. There's punch to colours, detail to dark levels and fine insight. DVD performance, too, is of a high standard. Switch to audio and DTS-HD Master Audio is open, dynamic and expressive. Our only problem is the price. A BD player and PVR of comparable picture and sound performance could be yours for £600.